YouTube video of this review (includes video footage): https://youtu.be/ukE1N7HOriQ . Hi guys. 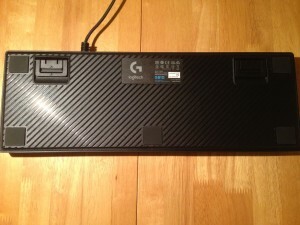 Today I am going to be reviewing the Logitech G810 keyboard. Right let’s start off with the design of the keyboard. It has a nice matte finish (which means no noticeable finger prints) on the top of it with the sides being glossy. It is fairly heavy coming in at 1180g (excluding the cable) so I would not recommend this to someone who wants a light, portable keyboard however you can be sure that if you were to take it places, it would not break easily. It has a premium feel to it and overall a great look and design. On the bottom it has a nice design with 5 flat rubber grips and 2 more if you include the stand as well. This means that while you are using it, it will not move all over the table or desk. This was a problem I had with my old membrane keyboard and it did not have any rubber grips at all. The stands are very well put in to place meaning that they will not break easily or snap off. The keyboard has 3 levels of adjustment 0 degrees, 4 degrees and 8 degrees. Personally I have it set to 8 degrees as this is where it feels most comfy. Having the keyboard at different angles can help relieve wrist strain. The keyboard does not have any macro keys, which is a bit of a shame, but at least they got rid of the horrible key caps that they used for the G910 and used normal ones instead. The keyboard also has a RGB “G” at the top left hand side which is also very stylish and adds to the keyboard premium design. You can tell that a lot of thought was put in to the keyboards design. The keyboard can come in different layouts. After typing on a mechanical keyboard, typing on a membrane one feels very mushy and not quite right. The USB cable and strain relief is extremely impressive. It, like the rest of the keyboard, is very rugged and has a stylish design. 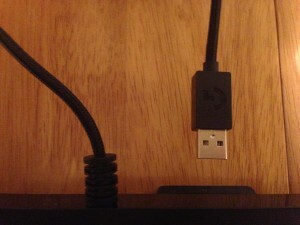 This cable is not likely to snap anytime soon. On to the key types. As you may know, the Logitech G810, G910, G410, and the G310 use a different key type to standard mechanical keyboards called Romer-G switches. This was introduced in 2014. It was made in partnership with Omron, a Japanese company that are an electronics company. They go through rigorous testing so you can be sure they will last a long time. Logitech claims that they will last for at least 70 million key-presses which is quite a bit more than any mechanical switch lasts for currently on the market. The key switches are designed to have the surface mounted LED in the middle so the light that shines through the key cap is vibrant and overall is much better than other back-lighting I have seen. This also means that there is less light leakage compared to other back-lighting. The Romer-G switch actuates at 1.5mm which is faster than the MX Cherry Red switch which actuates at 2mm. This could give you the edge in a competitive game since it registers the key press faster. This makes the keyboard extremely responsive and suitable for competitive play. The force needed to push the switch is 45 grams like the MX Cherry Red and Brown switch types. Having this fancy new key type does come at a cost though. You cannot replace the key caps with standard Cherry MX keycaps which is a shame for some. An interesting video of a factory tour of the Romer-G key switch from Linus Tech Tips can be by clicking here. 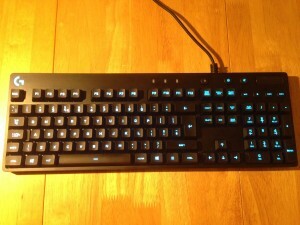 As with most mechanical keyboards, the keyboard has anti-ghosting on every key which means that you can press all the keys at once and each one will be registered by the computer. This is very useful for gamers who may sometimes press multiple keys at once in games. I personally have seen the benefit of this. button. The gaming mode button disables keys based on the game. This is customized through the software. By default it disables the menu key and both window keys however, as I said, this can be changed to different keys to a game by game basis. The mute button and volume scroll wheel are quite self-explanatory. They are very useful for when you are in a game and don’t want to tab out to adjust you volume. The media buttons are also very useful for when in a game or if you have music/a video in the background. A video that I made on how to get them to control VLC, Firefox, and Chrome can be found by clicking here. Since I never use the stop button for media, I use it to mute myself in TeamSpeak. Now on to the software. The software is very easy to pick up and understand, however it may take a while to learn how to use the advanced features like macros however. 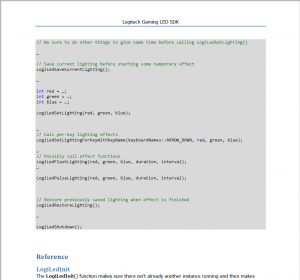 Despite the software being simple to use, there are quite a few lighting effects. Different colour effects range from having the keyboard all one colour, to having certain parts of it different colours (such as having the arrow keys orange). The fancy’s effects can be thing’s such as making the keyboard look like its breathing, having a rainbow colour travel through it, having random keys change colour to add a star effect, and having key presses change the key colour for a while. Another cool effect, that may not be the most practical but is interesting, is the colour map feature. 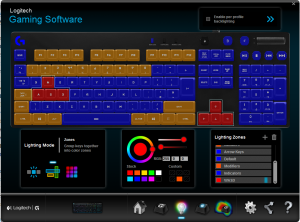 This feature allows you to use colour to see which keys you press the most, or how much time you press them for using colour. Something they could add is to be able to use the Game Mode button as a hotkey so hopefully this can be done in the future since I never really use the game mode button. When I made my keyboards colour scheme I could only use that for everything since when I turned on “Per profile backlighting” it replaced the colour scheme I had made so make sure you turn this on before making your colour scheme or else you will have to remake it when you turn it on. Another slight problem I had with the software is that it is not re-sizable meaning that when I installed the software on my laptop, it didn’t fit the screen properly. app. 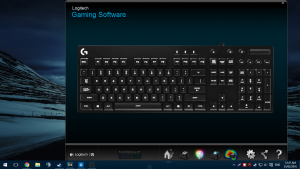 This app works with the Logitech software to show your computer details but also allows you to control some aspects from it. Overall, the keyboard is an excellent choice however it does come at a price. The keyboard is currently £139.99 or $159.99 US (on Logitech’s website, on the 20th of February 2016) which is quite hefty for some however this price is to be expected for such a high quality piece of kit. The keyboard comes with a 2 year warranty and if you order before April the 1st 2016, you get a copy of Tom Clancy’s The Division free which is worth around £30 to £40. © Copyright 2016 ZACY5000 .